In this post, I will tackle the door frame and door. The construction method is the same as for the other three walls, but slightly more involved to ensure the door is secure and watertight. The first step in the construction of the fourth wall was to add a sole plate (or sill) along the full width of the wall. This was constructed from the same 95 x 45mm timber as the floor support frame. I cut slots to fit the ends of the floor frame so that the front of the sole plate was level with the front of the corner posts. I then treated the sole plate and then screwed it to the floor frame and the front edge of the OSB floor. 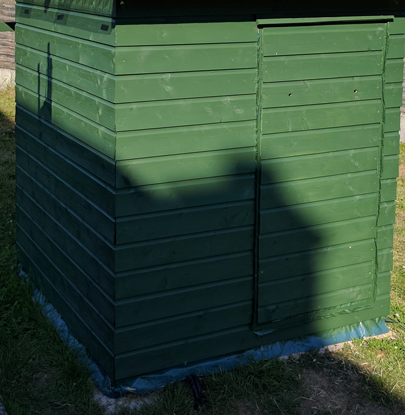 Next the wall and door frame were made from 25 x 50mm roof battens. Two battens were attached back to back to form the top of the frame and two half-length battens used to form the bottom of half-wall frame. Two more battens were used to form the upright. A final set of battens were screwed to form the front of the door frame flush with the front of the corner posts. A treated length of 75 x 45mm timber was set at the top between the roof runners to cap the wall. As previously noted, this should be slightly higher than the rear wall cap by a few cm. 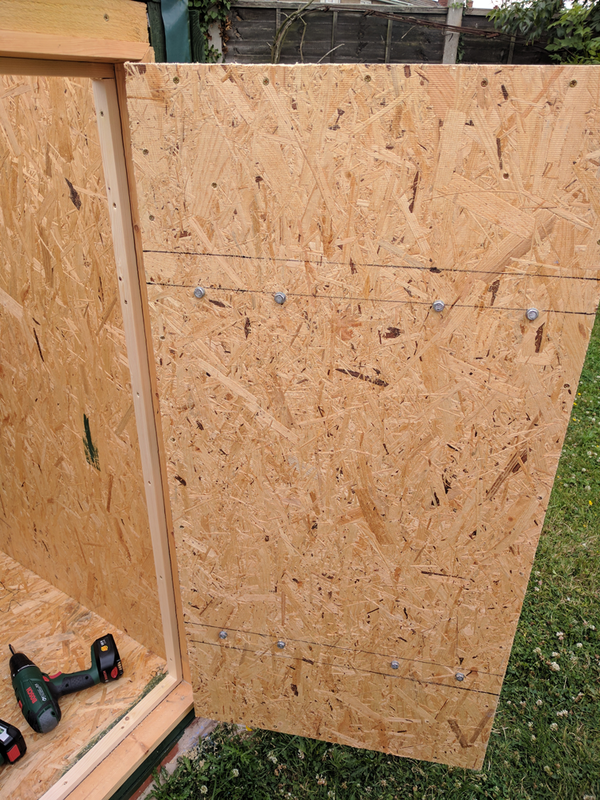 The inside of the half wall and inside of the top frame were clad in OSB in the same manner as the other walls. The inner of the door frame was faced with 20.5 x 94 mm planed timber using 45 degree mitre joints at the corners. This was screwed to the wall batten frame, the sole plate and the corner post as appropriate. Polystyrene insulation board and vapour barrier sheet were fitted to the half wall in the same manner as for the other walls. Now it was time to put the door together. I would recommend taking exact measurements from the door frame ‘as built’ to ensure a good fit, but allow a couple of millimetres gap all around for expansion of the door, warping of the frame and hinges sagging. The door was constructed from 44 x 44mm kiln dried timber using a simple rectangular frame with corner braces. 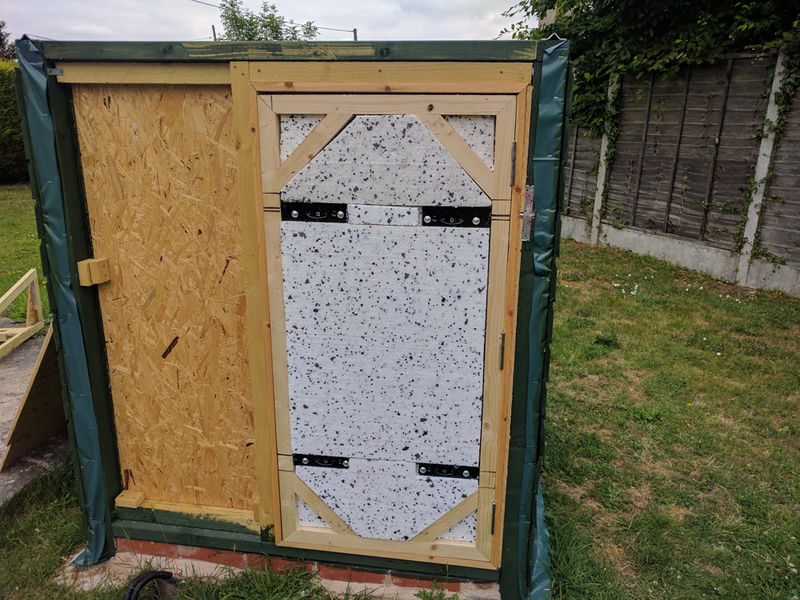 The rear of the door was made from 11mm OSB cut to size with polystyrene board inserted in to the frame for insulation. The door was relatively heavy once complete, so was hung using three heavy duty hinges attached to the corner post side of the door frame. You will need to use a wood chisel to cut recesses in the frame and door for the hinges to get a good fit. 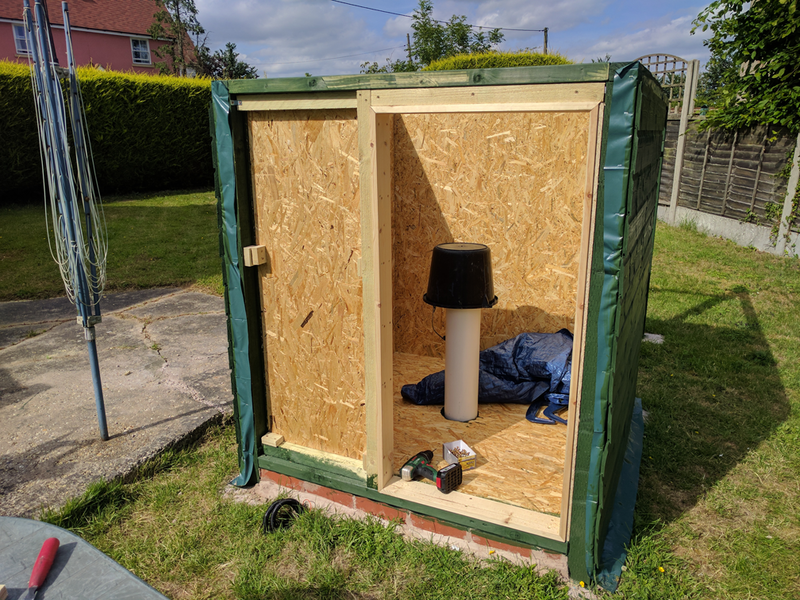 I managed to hang the door single-handed by supporting it with a length of timber underneath, but this job is definitely easier with an assistant. I fitted 4 x garage door security locks to secure the door, ensuring that the securing bolts were on the inside of the door and cut to length to avoid a snagging hazard. These locks shoot hardened bolts in to metal cylinders fitted in the door frames. Since the door has to open outwards due to limited internal space, the hinge joints are exposed. This makes it essential to have some kind of lock on both door edges otherwise it would be possible to remove the hinge pins and lever the door out of the frame. All exposed edges of the door frame and door were treated with Ducksback and vapour barrier sheet was then stapled to the front of the door. Once the door was hung satisfactorily, I clad both the door and the half-wall in shiplap as before. 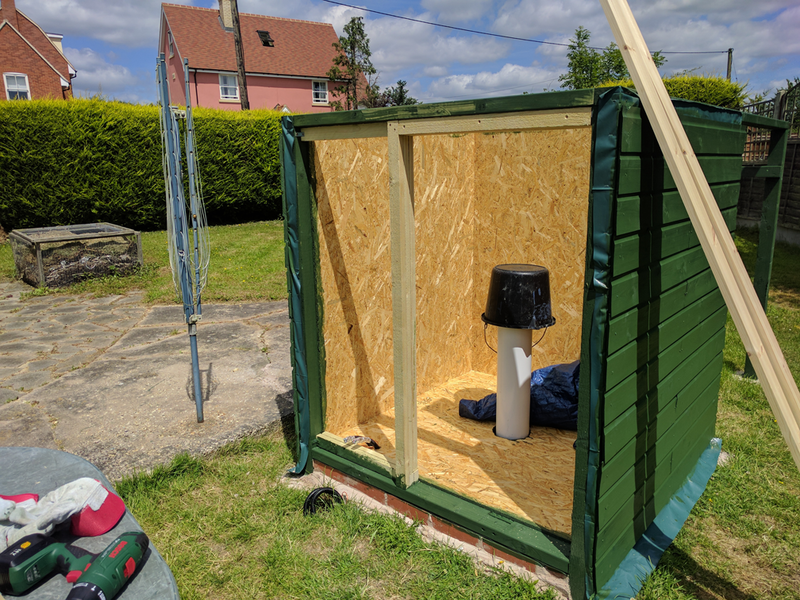 The top and bottom runs of cladding were cut out around the door opening, and some of the short off-cuts I had saved were used to clad the fence post side of the wall. I fitted a small protruding lip above the door frame to deflect any water drips away from the top of the door and added a small bow handle to the door. The final step was to lock the door in the closed position and then fit treated lengths of 20 x 44mm planed timber to the door frame flush with the rear of the door to seal the gap around the edges against water ingress. That’s it for the walls. In the next post we’ll move on to constructing the roll-off roof.